Some years, the zucchini hogs all the glory, just producing and producing and flowering and fruiting out all over the place. the cuke has had its year and green beans know how to arrive in glory. But I garden mostly for tomatoes and this year is just a really good tomato year. 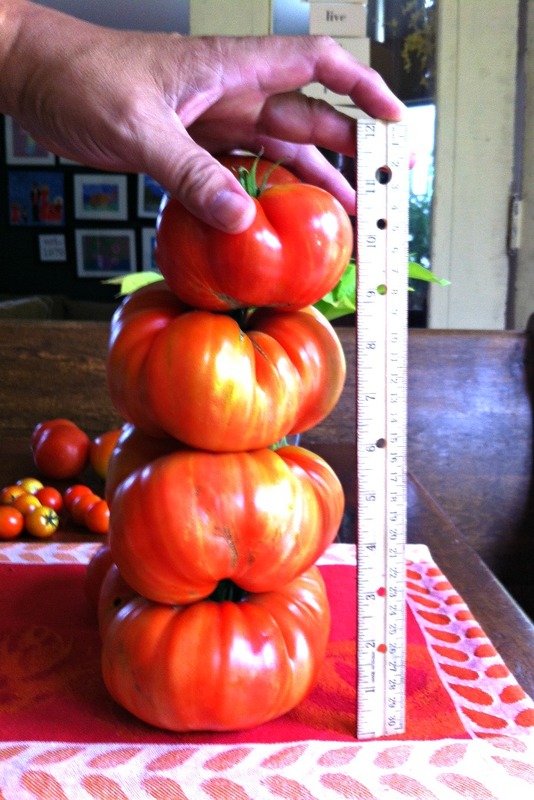 When I stumbled in to the kitchen for coffee this morning and saw tomatoes in bowls and on trays on every counter and the kitchen table, too, I realized that I must have picked at least 3 dozen tomatoes yesterday – to add to a couple dozen still just sitting around. That included tomatoes from 4 plants: an heirloom tomato, which, as they are known to be prone, contracted a disease and is dying, but still yielding its’ fruit like crazy (a lesson to be learned); a Sweet-100 cherry tomato plant which is madly fruiting golf-ball-sized tomatoes, an over-achiever to be sure; an Early Girl, which wasn’t particularly early, but which is certainly giving us armfuls of perfectly-globed 6-8 oz. 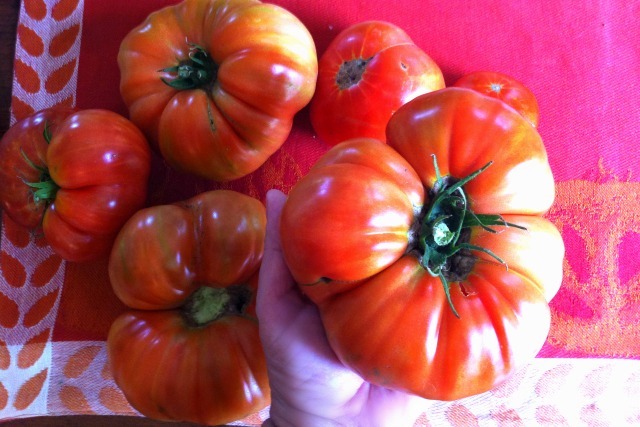 tomatoes; and finally the beefsteak. I picked almost a dozen of them yesterday and at least 6 of them were almost a pound each. They hang off a slice of bread – they’re that big. And that is fun. Dave was helping me show some off (below) – but then I got more!